Private tours mean that your journey will not mix or share with other persons. So during the tours there will be only you and colleague or partners. Itinerary or places of interest can be discuss directly to the driver as your guide as well. He will very happy to share his knowledge and experience about all interesting places and attractions in Bali. How come the private tours price can be very reasonable??? It's all because we are totally local! How we worked is just like a small community, everything we did by our self and help each other. "We work together for our better life" is our motto! Our service will reach most area in Bali like Nusa Dua, Uluwatu, Jimbaran, Ungasan, Pecatu, Tanjung benoa, Kuta, Legian, Seminyak, Kerobokan, Canggu, Tanah Lot, Sanur, Ubud, Tegalalang, Kintamani, Lovina, Singaraja, Bedugul, Sidemen, Karangasem, Padang bai etc.. Now we are ready to serve all of you for Bali Summer Holiday 2017. Enjoy our beautiful nature such as famous beaches like Kuta beach, Seminyak beach, Padang padang beach, Blue point beach, Dream land beach etc or Kintamani volcano mountain or Bedugul Beratan lake, Bali waterfalls or visit Tanah lot or Uluwatu temple which is famous with its amazing sunset views. 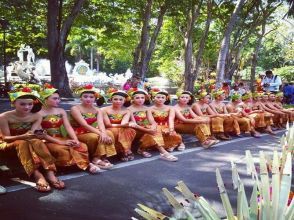 Lets make your Bali trip with us, The best Bali Local Tour Guide!